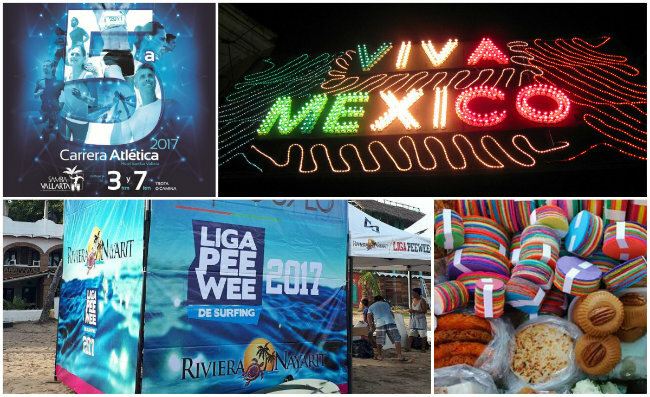 The Pee Wee Surfing League, the 5th Flamingos Race, and the Patron Saint Feasts in San Pancho are just a sampling of what Mexico’s Pacific Treasure offers during this ninth month of the year. Tourism promotion of the Riviera Nayarit continues throughout September with a series of activities backed by the Groups and Events office. Even though Mexican traditions and culture dominate this very patriotic month, there’s also plenty of room for sports. The Riviera Nayarit Convention and Visitors Bureau (CVB) is a firm supporter of events—over 80 each year—that not only attract thousands of visitors and shine an international spotlight on the destination, but also represent an important revenue stream for the community. It’s San Pancho’s turn to welcome the iterant surfing tournament, which travels through the coastal villages of Nayarit in search of new talent for this extreme sport. The league is presented by Ramos Shapes, Sunset Bungalows and Los Rudos SurfShop, using the competition formats established by the World Championship Tour Top 33 from the World Surf League (WSL), the ISA (International Surfing Association) and the Nayarit State Surfing Association (AENAY by its acronym in Spanish), with the support of the local surfing clubs from the different host towns and the Riviera Nayarit CVB. This recreational race will be held for the 4th consecutive year with the slogan “Running for Our Health.” Its main purpose is to encourage sports, but it also gives the runners a great excuse to vacation in the Riviera Nayarit. The host hotel is the Samba Vallarta by Emporio Hotels & Suites by Grupo Diestra, located in Flamingos. San Pancho once again hosts this itinerant tournament for kids between the ages of 4 and 12. It seeks to promote surfing as well as attract family tourism to the different coastal villages that host the competition.